When pen becomes mightier than sword,the pen of protest has more relevance,especially at the time of suppressing freedom of expression. Dileef made this ‘biggest ‘ball pen to register his protest against the violation of freedom of expression and brutal killing of journalists and activists. The program was organized in the wake of the murder of Gauri Lankesh,a senior woman journalist in Bangalore,recently. The cartoonist took 20 days for making this gigantic pen.He worked 12 hours daily to make this perfect. The pen has red,yellow and white colours.Spray paint is used.It costs around 3 lakh rupees.Besides Dileef , six workers also took part in the pen making. 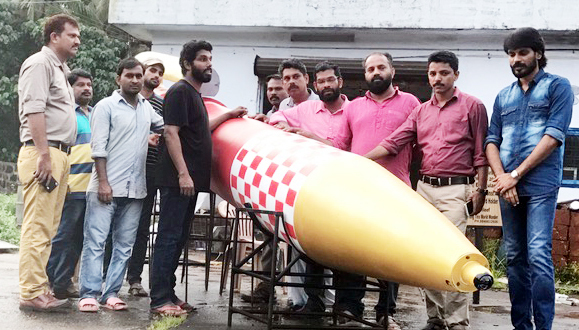 According to the cartoonist,the pen is expected to enter in the Guinness Book of World Records.Its first exhibition will be held at Oberon Hall,Ernakulam on September 21. The team is planning to display another pen at Sharjah in Novmber . Cartoonist Dileef, Abdul Majeed , Yaseen Ashraf ,Faisal were present on the occasion. This News was posted on Monday, September 18th, 2017 at 4:21 pm and is filed under City Talk.